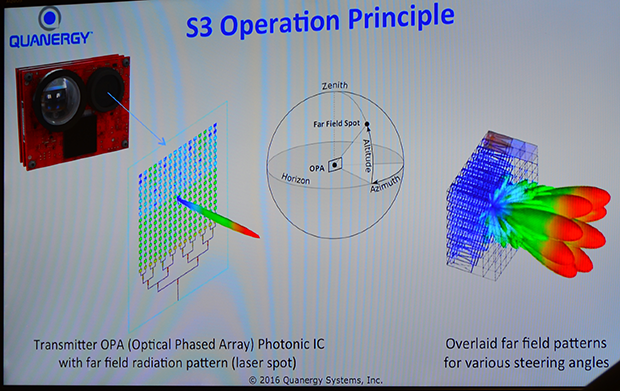 Yesterday at CES, Quanergy, an automotive startup based in Sunnyvale, Calif., held a press conference to announce the S3, a solid-state LIDAR system designed primarily to bring versatile, comprehensive, and affordable sensing to autonomous cars. The S3 is small, has no moving parts, and in production volume will be US $250 or less. 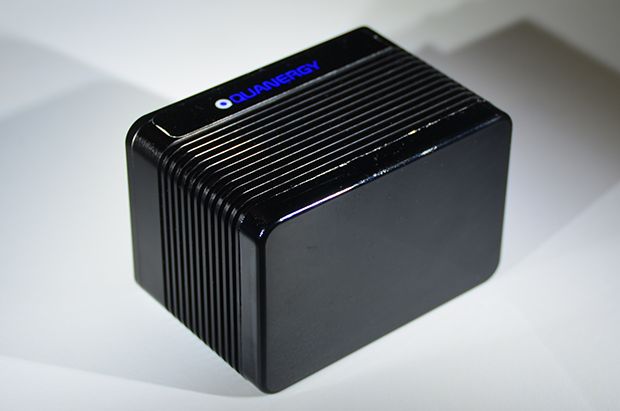 According to Quanergy, the S3 is better than traditional LIDAR systems in every single way, and will make it easier and cheaper for robots of all kinds to sense what’s going on in the world around them. LIDAR systems work by firing laser pulses out into the world and then watching to see if the light reflects off of something. By starting a timer when the pulse goes out and then stopping the timer when the sensor sees a reflection, the LIDAR can do some math to figure out how far away the source of the reflection is. And by keeping careful track of where it’s pointing the laser, the LIDAR gets all of the data that it needs to place the point in 3D space. In order to build up a complete view of the world, a LIDAR needs to send out laser pulses all over the place. The way to do it is to have one laser and one sensor and them move them both around a whole bunch, usually by scanning the whole LIDAR unit up and down or spinning it in a circle or both. You’ve probably seen these things whirling around on the top of autonomous cars. And they work fine, but they’ve got some problems: namely, they’re kind of big, they’re stupendously expensive, and because they have to be moving all the time, they’re not really reliable enough for consumer use. Each pulse is sent out in about a microsecond, yielding about a million points of data per second. And because it’s all solid-state electronics, you can steer each pulse completely independently, sending out one pulse in one direction and another pulse in a completely different direction just one microsecond later. Essentially, you can think of Quanergy’s chip as acting like a conventional glass lens, except that it’s a lens that you can reshape into any shape you want every single microsecond. Laser Lidar is a problem since use of power lasers in public space is banned by default. To beam laser impulse as an 2D array is $1 well known technology from laser pointers. The problem is how to process flashed array back in parallel at a reasonable speed. to use banned power laser in public space. So video passive radar is what is sought by automotive industry. No more "Laser Device" warning label. and 3D video can be played back in real time. I don't but laser Lidar. Okay, so $250 price point is for 100,000 pieces. Yeesh. How much does one cost? @Darius Jack; can you point me towards the legislation that bans lasers in public? As it is, this system does not flash multiple lasers; not in the manner you're thinking. Rather, it uses multiple diodes (or some other emitter) to create a single laser which can be repositioned faster than a mechanical system. alike technology has been adopted by USG scanner head to produce 3D imaging. The problem with lasers is exactly the problem with mobile telephony base station. I have studied 20 cancer cases among rural residents living close to mobile telephony case station, identified within 1 year. published reports warning individuals to limit use of cell phones, exposure to WiFi, microwaves, Cancer Institute from Paris banned used of cell phones and WiFi at schools. The same legal problem is with any device offered to the public, called laser emitter, for use in public space, in open space. as exactly WHO did, setting new microwave hypersensitivity syndrome. Just call your Laser Lidar - LED Phase Laser to live on the safe side of the river. While I'm not from the US, just curious about legislation there, the big difference that appears to me is that these regulations mainly or entirely apply to visible light lasers, with some regulations only applying to those sold specifically as "laser pointers" for the intention of a human operator to use the laser as an indicating device (there's other regulations for surveying, medical and education / entertainment lasers, but there's a bit to read through for those). As the device being advertised above is intended for navigation / topography, I gain the impression that it will be an infrared laser, as used in things like self-driving cars, robotics, the Kinect, etc. If this is the case, it will not be subject to many of these restrictions, so long as it follows the output limits defined in Title 21, which vary based on wavelength and the duration of emission, but seem reasonable. While I don't know if these new lasers will require any licenses, we can nevertheless expect to see them operated under the same regulations that allow Google's cars to map public roads with LIDAR, etc. It's exciting. Better than Velodyne. It remains to be seen though what level of access the general public will get. For example, scanning radar is available in cars today and I'm sure costs much less than $1000 per sensor, but to get a device with generic firmware is either very expensive (e.g. for delphi, autonomoustuff.com says please email for prices) or impossible (e.g. Bosch). While I don't know if these new lasers will require any licenses, we can nevertheless expect to see them operated under the same regulations that allow Google's cars to map public roads with LIDAR, etc." Lidar Laser is an old technology. passive video radar or car camera works faster, gives higher resolution and is readily available for any car. And video imaginery can be real-processed to build 3D environment. Google implemented old technology, starting experiments 10-15 years ago. Today Agisoft and others offer real-time Hi-Res image > 3D environment processing. What matters is 1cm accuracy, 1cm resolution RTK GPS mount in your car. to fly by high accuracy GPS to avoid collision, crash and problems in general. Visual control is ok in case of model drones for hobby use. not to mention low-precision self-driving cars promoted at Las Vegas CES 2016 today.